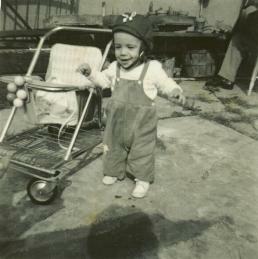 I am born in New Britain in General Hospital on February 15, 1960; only one minute after St. Valentine's Day. At the time, my father is working at Stanley Tools. I am walking in only six months (that's me, six months old, in the photo), apparently eager to start my lifetime of adventures. New Britain is known as the "Hardware city," due largely to the home plant for Stanley Tools being here since 1843. In about 1800, the city began producing sleigh bells and farm tools, then locks and hardware for saddles. The city was settled in 1686.